well as significant challenges confronting the rising generations. A collaboration among scholars of history, religious studies, theology, political science, and ethnic studies, the volume offers unique insight into a vibrant and sometimes controversial movement, the future of which is closely tied to the future of America. In Islamic History and Law, Labeeb Ahmed Bsoul undertakes an extensive examination of Islamic intellectual history, covering ages that witnessed different movements and doctrinal trends. While political and geographical factors certainly influenced the Islamic religious sciences, internal and intellectual factors exerted a much more substantial influence. This study gives priority to jurists’ intellectual operations throughout the Muslim world, covering the historical development of Islamic jurisprudence from the middle of 4th century. Bsoul’s examination of jurisprudential advances takes into account the shifting dominance of particular centers of legal scholarship in light of competing doctrines and their adherents. This work sheds light on jurists of North Africa and the Andalus, who are rarely mentioned in general modern works, and also aims to demonstrate Muslim women’s important role in the history of jurisprudence, highlighting their participation in the Islamic sciences. Bsoul relies mainly on Arabic primary sources to give an impartial presentation of these jurists and produce an accurate memory of the past based on objective knowledge. The Politics and Practice of Religious Diversity engages with one of the most characteristic features of modern society. An increasingly prominent and potentially contentious phenomenon, religious diversity is intimately associated with contemporary issues such as migration, human rights, social cohesion, socio-cultural pluralisation, political jurisdiction, globalisation, and reactionary belief systems. This edited collection of specially-commissioned chapters provides an unrivalled geographical coverage and multidisciplinary treatment of the socio-political processes and institutional practices provoked by, and associated with, religious diversity. Alongside chapters treating religious diversity in the ‘BRIC’ countries of Brazil, Russia, India and China, are contributions which discuss Australia, Finland, Mexico, South Africa, the UK, and the United States. This book provides an accessible, distinctive and timely treatment of a topic which is inextricably linked with modern society’s progressively diverse and global trajectory. Written and structured as an accessible volume for the student reader, this book is of immediate interest to both academics and laypersons working in mainstream and political sociology, sociology of religion, human geography, politics, area studies, migration studies and religious studies. Studying Religions with the Iron Curtain Closed and Open. The Academic Study of Religion in Eastern Europe offers an account of the research focused on the origins, development and the current situation of the Study of Religions in the 20th century in the countries of the region such as Czech Republic, Poland, Slovakia, Hungary, Estonia, Latvia, Ukraine and Russia. Special attention is devoted to the ideological influences determining the interpretation of religion, especially connected with the rise of Marxist-Leninist criticism of religion. The international law on religious freedom is not limited to religion, but denotes a set of legal measures set in motion to protect beliefs and their ”manifestations” from undue limitations and interference. Explicitly covering beliefs well beyond the confines of any traditional definition of religion, the right as it is codified in the Universal Declaration of Human Rights (UDHR), the International Covenant on Civil and Political Rights (ICCPR), and surrounding legal texts – collectively known as the International Bill of Rights – does not require legal systems, whether international or domestic, to decide on the merits of one religion over another. The expansive nature of the freedom of religion or belief in international law thus provides an unequivocal answer in the negative to the overarching question in all dealings with religion in political or legal contexts: whether religion is a special, set apart, sui generis concept that requires particular attention and protection over other concerns. Religion, as it is construed in international legal texts, is just one subset of an expansive range of protected beliefs that can be subjectively held without any form of state interference. While the inclusion of terms like “manifestation,” “observance,” “belief,” and “conscience” are drawn from, and therefore clearly favor, certain religious traditions to the exclusion of others, their interpretation in the practice of the UN Human Rights Committee are explicitly detached from a religious framework. Once the serene, inclusive, and clear-cut concept of religious freedom in international law is confronted with the myriad cultural, historical, political and academic iterations of religious freedom that dominate domestic legal practice, however, the content of “religion and belief” moves from being non-theist and inclusive to a more ambivalent status: in these competing visions of what religious freedom may or may not be, the contents of both “religion” and its relation to “freedom” is hotly contested. These contestations take place across a wide array of societal spheres, and concern the origin and metaphysical status of religion in society and the political sphere; what groups, doctrines and practices can be construed as “religious” and competencies and duties arising from this identification; and the relationship between majority and minority religious traditions in history and culture. Contrary to the dictates of international law, the vast majority of competing visions of religious freedom in the domestic sphere are united by their emphasis on the determination of religion as religion…. Sullivan and DeGirolami prescribe solutions that display very different views of the power of law, but share a basic conviction that social practices that can fall under the rubric of religion are worthy of legal protection or non-interference. Where Sullivan suggests that law is unable to grant this form of protection due to its preference for certain majority traditions over lived religious practice, DeGirolami seems to consider this preference part of the culturally contingent settlements on which law relies, a preference that cannot be unsettled by the findings of academics. Although one would expect a cultural affinity between US and international law on religious freedom in their shared preference for Protestant conceptions of religion, neither Sullivan nor DeGirolami address the international legal framework, demonstrating the splendid isolation of US legislation and jurisprudence on this issue. This isolation is a common feature of US law, which has a longstanding tradition of ignoring international law. Additionally, the turning point of the non-establishment clause of the US constitutional law on religious freedom is the neutrality of the state, an issue entirely outside the purview of international law. As someone who studies the politics of secularism and religion comparatively and internationally, I became interested in religious freedom promotion because, quite simply, everyone is for it. Both liberal internationalists and those affirming a divine origin of the right to religious freedom, and almost everyone else, seem to have accepted the notion of religious freedom as a fundamental human right, legal standard, and social fact that can be objectively measured and achieved by all political collectivities. It is a matter of persuading people and governments to understand and comply with a universal standard. Peace, inter-communal harmony and prosperity will follow. States and societies are positioned along a spectrum of progress, inclined either toward the achievement of religious freedom as a social fact, or slipping back into religious persecution and violence caused by religious hatred…. In my experience these concerns about religious freedom only multiply and intensify the more one considers the diverse histories and politics that attend religious freedom advocacy. Over the past three years I have co-directed the Politics of Religious Freedom project, a collaborative effort to study the discourses of religious freedom in South Asia, North Africa, Europe, the United States, sub-Saharan Africa, and Brazil. In re-describing the historical and cultural assumptions underlying national and international projects to promote religious freedom, we have sought to unsettle the agreement in policy circles that religious freedom is a singular achievement, and that the problem lies in its incomplete realization. Is it possible that a norm intended to secure human flourishing and peaceful co-existence could in some circumstances enact the opposite? If you are not familiar with Helge Årsheim’s blog–PluRel–which is a project of the University of Oslo, you should check it out! He has posted an exchange between Winnifred Fallers Sullivan and Sindre Bangstad that is well worth reading on some of the subjects that I’ve recently been discussing. Helge has also kindly reproduced some of my thoughts over there, which, though not composed as direct responses, are in various ways responsive to Sullivan and Bangstad. Helge is a PhD student in the school of theology doing some very interesting work on religious pluralism and international law at the United Nations. A few additional thoughts on the convergences and divergences of law and the academic study of religion, prompted by thoughtful emails from legal and ASR scholars Nelson Tebbe and Donald Drakeman. Both law and ASR may be similar in that they harbor anxieties about their methodological uniqueness and about the autonomy of their disciplines as fields of academic inquiry. In law, this has been a perpetual worry that became particularly acute in the 20th century, as scholars from Pound to Holmes to Posner have argued compellingly for law’s non-autonomy. Indeed, Posner has advocated the project of “overcoming” law: what takes the reins after law has been overcome is economics, philosophy, political science, or some other discipline with truly independent methodological bona fides (it’s mostly economics for Posner). Though it is not my field (and so I hope to be corrected by those who know better), my sense is that ASR has some of these same anxieties but in its case, the anxieties are connected to the conceptual distinctiveness of the subject matter that it studies. Certainly in law, self-justification and disciplinary apology are not unknown. Practice and Theory: Maintaining or Collapsing the Division? Both law and ASR have roots as practical endeavors–as trades and professions, rather than as purely academic subjects. For law this is obvious; for ASR the root is theology and ministry. And law schools and divinity schools historically functioned to prepare tradesmen; indeed, both continue to operate primarily to train future practitioners of their respective trades. I am greatly looking forward to participating in a conference next month called, “The Politics of Religious Freedom,” and hosted by four scholars who have been at the forefront of drawing connections between the academic study of religion (or religious studies) and law–Peter Danchin, Elizabeth Shakman Hurd, Saba Mahmood, and Winnifred Fallers Sullivan. The title of my panel is “Religion and Politics After Religious Freedom.” With the organizers’ permission, I am posting some comments that I wrote up in response to that subject. My sense is that while there may be some issues specific to the particular interdisciplinary relationship of law and the academic study of religion, at least some of the points I make may apply more broadly to the question of law’s distinctiveness as both a practical and an academic discipline. I welcome your thoughts. My work considers the religion clauses of the First Amendment to the United States Constitution and the body of federal and state laws protecting religious freedom in the United States. One theme in my work involves doubt about the law’s capacity to protect everything worth protecting about religion and religious practice. Here the law is limited and imperfect—both because of the limits of human reason and because of the inevitable conflicts of human interests and aspirations. The law’s limits come sharply into focus for what I have called “comic” theories of religious freedom—theories that reduce religious freedom under the Constitution to one or a small set of values (most commonly equality, neutrality, and the separation of church and state). None of these comic theories includes a sufficient accounting of the costs (including the costs to religious freedom) of such a reduction. These are some of the ideas explored in my book, The Tragedy of Religious Freedom. The topic of our panel is “Religion and Politics after Religious Freedom,” and there are several ways in which my views are sympathetic, and might even converge, with the project of exploring what might come “after” certain conceptions of religious freedom. By reducing the reasons to protect religious freedom under the Constitution to single values such as equality or neutrality, some comic conceptions of it flatten legal disputes in ways that fundamentally misconstrue the true nature of the conflicts within them. Since what goes under the label of religion is culturally contingent, multifarious, and multifunctional—ideological, personal, political, institutional, communal, a phenomenon of cultural identity and at the same time a source of trans-temporal truth—one ought to expect the same variety, conflict, and incommensurability among and within the conceptions of religious liberty cherished by particular communities and enlisted to protect religion under the Constitution. It may be that legal conceptions of religious liberty not only are insufficiently capacious to accommodate the welter of reasons to protect religious freedom (this would not be a failing unique to this area of law) but are also so grossly inadequate as to demand some radical alternative. We would, in that case, be well-advised to begin thinking about what should come “after” laws and theories that are irredeemably maladapted to the purpose. But before reaching this conclusion, we ought at least to move away from comic accounts of religious liberty and begin to hear the music of religious freedom in a more tragic key—in a way that embraces a plurality of values and that necessarily involves sacrificing ends about which we care deeply. In other ways, however, my views are in at least some tension with the project’s ambitions to get past, or over, or somehow beyond religious freedom. I suspect that this skepticism about getting beyond religious freedom may relate to broader differences of interest, focus, and purpose between the disciplines of law and the academic study of religion (ASR). To indulge in an overgeneralization (though one that, I hope, captures something true): ASR scholars are interested in dissolving religion; legal scholars are interested in managing it. There are several reasons that the pungent and interesting critique of religion and religious freedom that has developed in ASR scholarship has been relatively slow to affect law and legal scholarship. 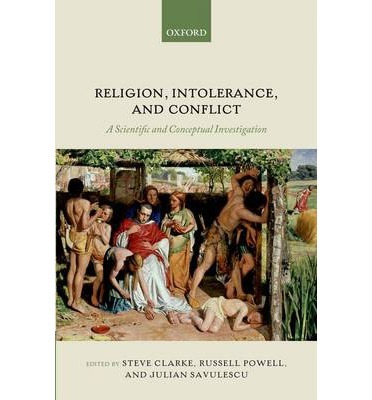 Here’s an interesting cross-disciplinary collection that assembles a reasonably broad range of contributors–Religion, Intolerance, and Conflict: A Scientific and Conceptual Investigation (OUP 2013), edited by Steve Clarke (Oxford), Russell Powell (BU), and Julian Savulescu (Oxford). The publisher’s description follows. The relationship between religion, intolerance and conflict has been the subject of intense discussion, particularly in the wake of the events of 9-11 and the ongoing threat of terrorism. This book contains original papers written by some of the world’s leading scholars in anthropology, psychology, philosophy, and theology exploring the scientific and conceptual dimensions of religion and human conflict. Authors investigate the following themes: the role of religion in promoting social cohesion and the conditions under which it will tend to do so; the role of religion in enabling and exacerbating conflict between different social groups and the conditions under which it will tend to do so; and the policy responses that we may be able to develop to ameliorate violent conflict and the limits to compromise between different religions. The book also contains two commentaries that distill, synthesize and critically evaluate key aspects of the individual chapters and central themes that run throughout the volume. The volume will be of great interest to all readers interested in the phenomenon of religious conflict and to academics across a variety of disciplines, including religious studies, philosophy, psychology, theology, cognitive science, anthropology, politics, international relations, and evolutionary biology.